« Can We Please Get out of the House? 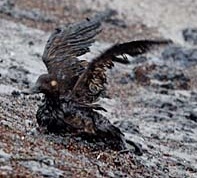 I suppose it was only a matter of time until an oil spill hit my beautiful city, but now it has. I’ve spent the last few days reading articles about the San Francisco Bay spill and clean-up. The articles are hard to read, and the pictures of oil-soaked sea life are heartbreaking to see. I may have left San Francisco for a new life in Kentucky, but I still love the place. One of the joys of life in the city was being able to stroll to any number of vantage points and take in the pristine splendor of the Bay. The air was fresh, and the view and sounds of the sea were both exhilarating and relaxing at the same time. Shouldn’t be possible, I know, but was. When Matt and I would get city stressed and feel the romance was dying, we’d walk to Land’s End (a 20-30 minute walk from our house), look out to the Marin Headlands, and say to ourselves, “Oh yeah, this is why we live here.” You can forgive a lot of panhandling, noise, expense, and petty politics when you live a comfortable walk from such staggering beauty. At times like that I’d feel blessed to live in what is, after all, one of the world’s top vacation spots. Now the birds and turtles are oil-coated, the beaches are closed, and I am very worried about my beautiful city. I know the locals are doing all they can to rescue as much as possible—and it’s heartening to know that the locals will always come to together in events such as these—but it doesn’t make it hurt any less.